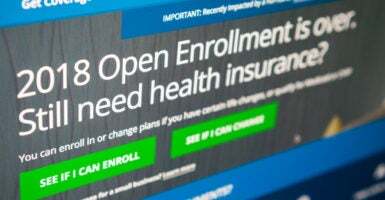 Roughly 400,000 fewer people signed up for Obamacare in 2018, Centers for Medicare and Medicaid Services Administrator Seema Verma announced Tuesday afternoon. “11.8 million consumers enrolled for 2018 Exchange coverage nationwide. Great job @CMSGov on the most cost-effective and successful open enrollment to date,” Verma tweeted Tuesday afternoon. 11.8 million consumers enrolled for 2018 Exchange coverage nationwide. Great job @CMSGov on the most cost-effective and successful open enrollment to date! That is a significant drop in enrollment from 2017, when 12.2 million Americans obtained coverage through the Obamacare state exchanges. The drop is in no small part due to President Donald Trump’s administration’s actions over the past year to undercut the Affordable Care Act, better known as Obamacare, after Republicans in Congress were repeatedly unable to repeal and replace Obamacare in 2017. Trump stopped funding for crucial subsidies, known as cost-sharing reductions, and cut funding for both the Obamacare navigator program and open enrollment advertising. Additionally, the Trump administration cut Obamacare’s open enrollment period in half, leaving Americans who wanted to sign up for Obamacare with a shorter time frame to obtain coverage. Despite the administration’s efforts, Obamacare is still getting an influx of new participants and retaining a fair amount of other users. Over 3.2 million first-time Obamacare participants signed up for a plan in 2018, according to the Centers for Medicare and Medicaid Services. Nearly 5.5 million actively sought to re-enroll in Obamacare. The vast majority of enrollees—7.16 million—live in non-rural areas, and over 6.1 million enrollees have household incomes 100-250 percent of the federal poverty line. The Centers for Medicare and Medicaid Services found $89 to be the average monthly premium after applying the Obamacare tax credit. Republicans are slowly backing away from trying to repeal and replace Obamacare, championing the repeal of the health care law’s individual mandate in the 2017 tax reform bill as the long-promised repeal and replace. The individual mandate repeal is likely another reason fewer Americans signed up for Obamacare in 2018. Without facing a penalty for failing to sign up for coverage, some Americans chose to forgo health coverage altogether.